Clever Storage Ideas You Never Thought Of! Small homes need storage, and sometimes they need storage ideas that are a little new. We all get tired of buying plastic containers and bathroom organizers. Time to find some clever, unique and inventive storage ideas you never thought of! Check out these inspirational projects and ideas for small space storage in your home! 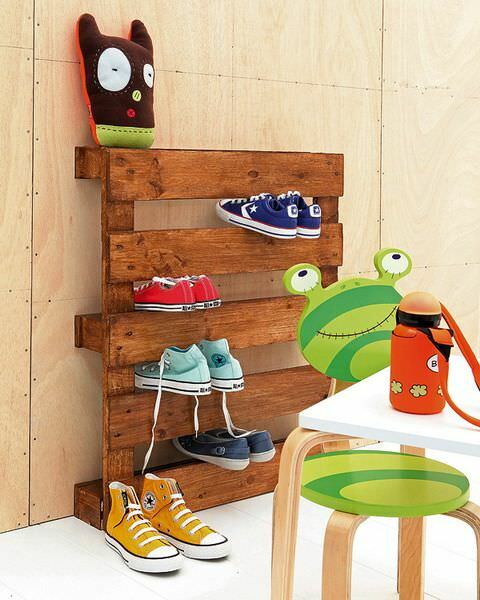 Staying on the pallet trend with everyone else, check out this creative use of a recycled wood pallet. Great for a mud room! Unknown photo source. A reader submitted this to the “This Old House” website. Not a simple project it looks like to me, but turned out just incredible! 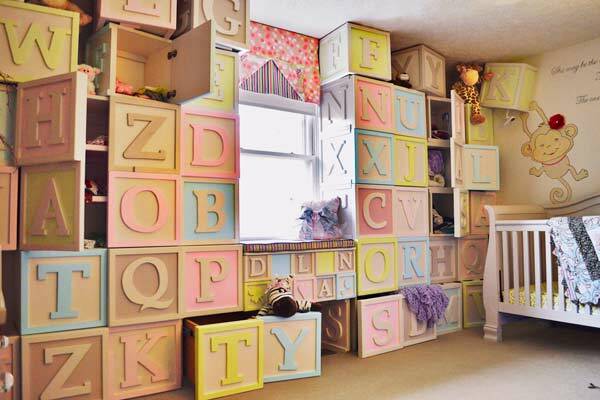 He made a wall of oversize alphabet blocks from MDF and wood, many of which were constructed as cabinets, drawers, and nooks to hold his daughter’s toys and clothes. 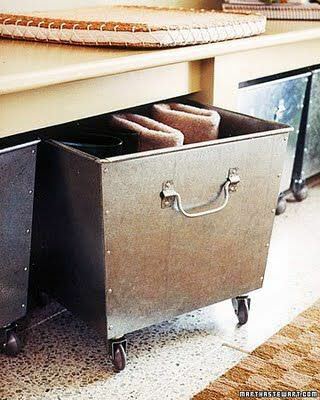 Bins on casters are an easy DIY solution to storage problems… and if they slide under something, all the better! From ‘Martha‘. 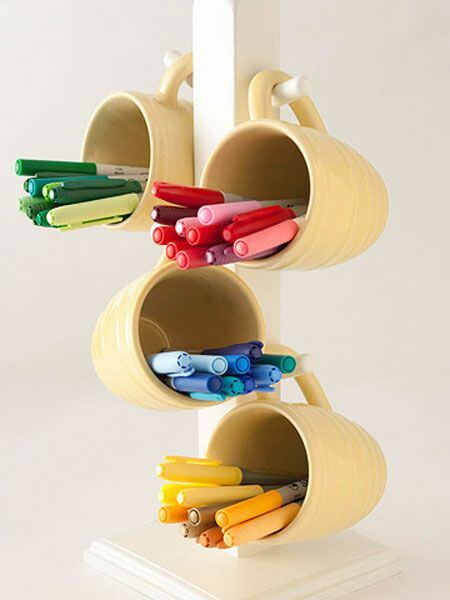 Using a cup tree and coffee cups as office supply storage is genius…and if you can’t find your morning coffee cup, you have a stand in! From ‘BHG‘. Check out this idea. More for inspiration, but maybe you could use a combination of wood and forms for pouring cement? Pretty cool! From ‘Zainteriora‘. 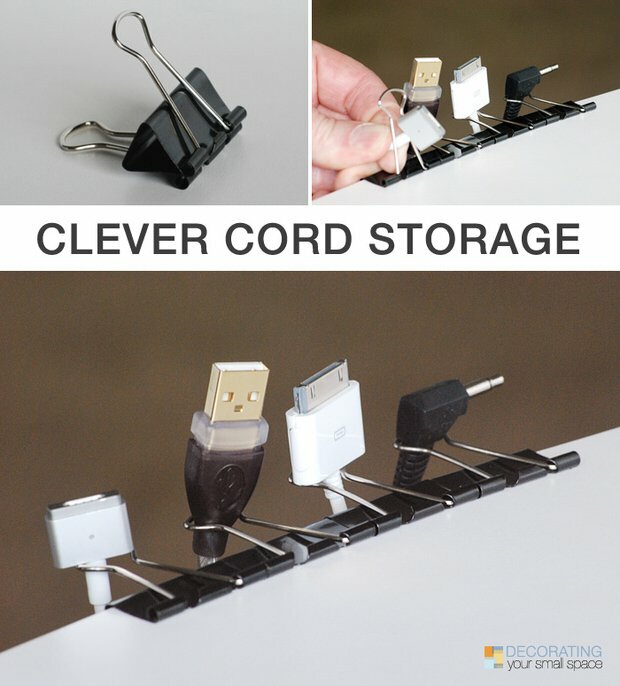 Quick way to keep your electrical cords handy and organized…with folder clips! We saw this on Pinterest and had to try this ourselves! Works great. Just make sure you use a big enough clip for some of the cords with bigger plugs or they won’t fit thru the clip very easily. 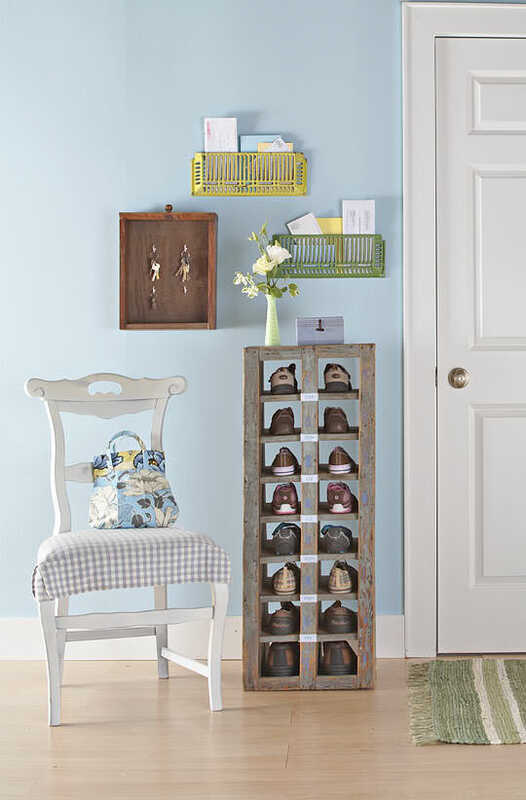 Love this shoe tower made from up-cycled crates! 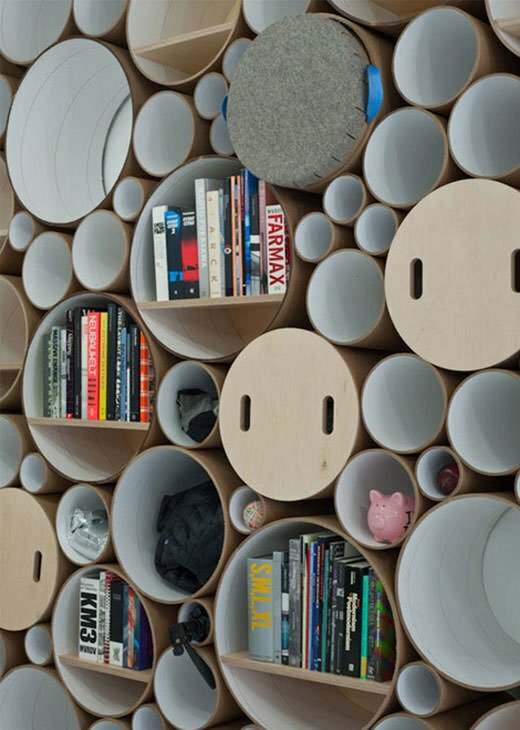 Amazing storage idea that looks amazing too! From ‘By Stephanie Lynn‘. 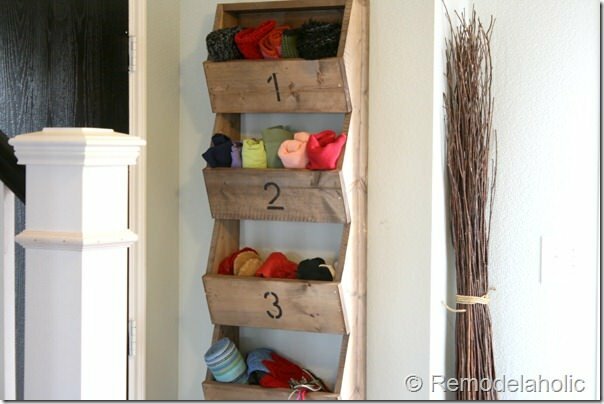 ‘Remodelaholic‘ has this wall storage bin tutorial… this bin is a cool but rustic design that would work in a mud room or an entry way…kitchen or office too! Wait…kids bedroom! 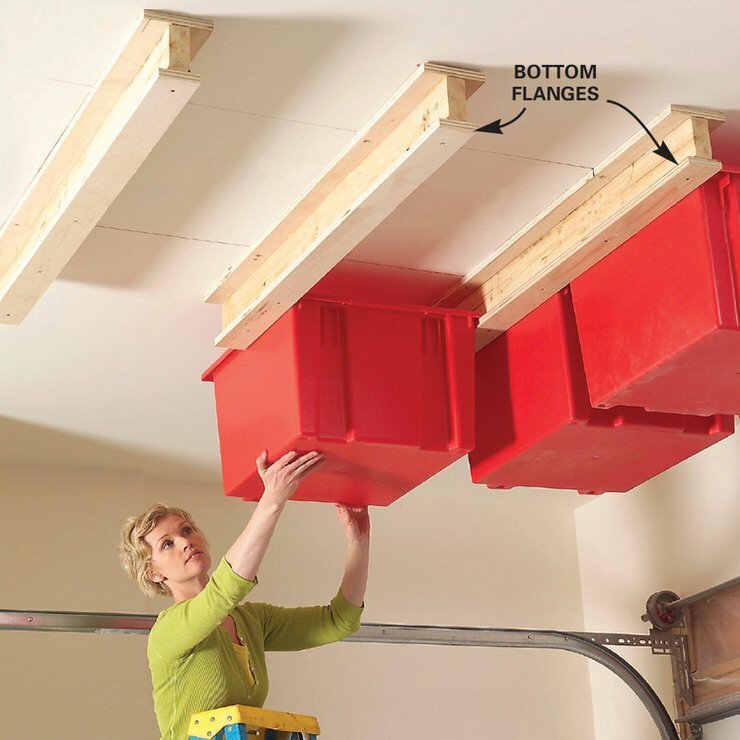 Create a sliding storage system in your garage with this tutorial from Family Handyman… How great is this? 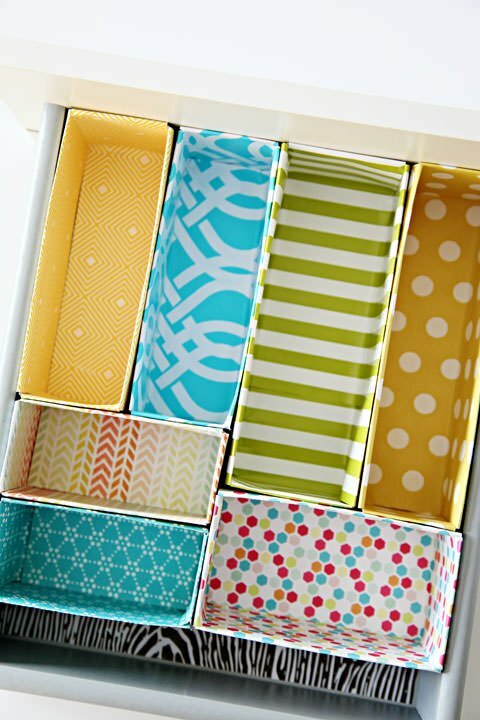 Jen over at I Heart Organizing has this great budget DIY project for making drawer dividers out of cereal boxes! 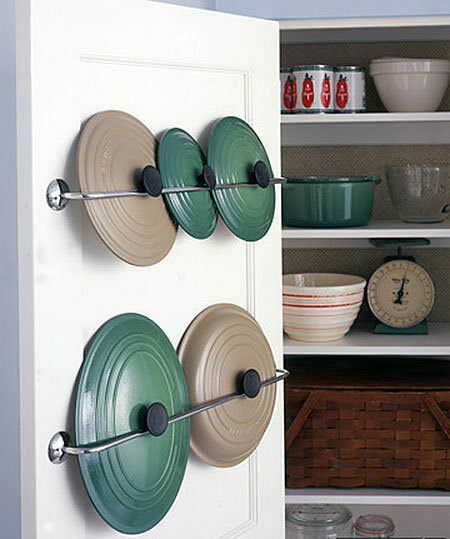 Finally, store kitchen items like pot lids on the back of cupboard doors using towel racks and gravity! This would work for those bulky utensils that won’t fit in the drawer too…ladles anyone? From ‘Martha‘. What are your best creative storage idea for all around the house? Share with our community in the comments! Then jump on over to our posts on 7 Ways to an Organized Fridge and Hide the Ugly, Indoor Eyesores! Good ideas! Those alphabet blocks are the coolest idea I’ve seen in a while. Not sure if that would be very easy to make, but it sure transforms the room. The folder clip idea for holding cords is great. But you don’t have to feed the plug ends through the loops in the clips: Pinch one or both silver loops to remove them from the black clip. Put the open loop(s) around the cord you want to hold and then squeeze each loop to put it back into the clip. That way you can load even large-plug cords into small clips. I purchased a canvas shoe organizer for the back of a door and use it on the back of my hall closet door to store gloves, winter hats, ear muffs, etc. Everyone knows where to find their cold weather items! And for the occasional damp glove that needs to dry a little before being placed back in a pocket I clip a few wooden clothes pins to a pocket so that the gloves can dry but will be a reminder to place them back when ready. We haven’t lost a hat or glove in ages. I use over the door shoe organizers in my laundry room for all my cleaning products, and another in my linen closet for medications, bandaids, cough drops etc. Rows are organized by cold, fever, headache (tylenol, aleve, ibuprofen etc) bandaids and antibiotic creams and first aid etc. BEST organization I have found in a long time! Keeps my bathroom cabinets from being over cluttered. Just a note that I did the folder clip idea over a year ago and it has been the greatest idea I have ever come across. No more lost cords! Simple and out of the way. Try it! I took an accordion hook thing and put it in my closet. I put jewelry on it. It is very helpful to me. Also, other things could be put on one. I use tie racks as well, holds lots and lots of necklaces. I use the accordion thing you referenced for my bracelets and I use ice cube trays (they stack) for earrings! Love utilizing coffee cup tree for office use. Will be moving mine to desk today! Drawer organizers from cereal boxes great recycling project. Thanks!